So, have you bought or made any gifts already? If so, do a quick walk around the house, gather all presents you have and put them on your dining room table so you can see exactly what you have (might be best to do this when the kids are in bed). Then write every single item into the Gift column. Next write down the names of who each gift is for into the Name column. 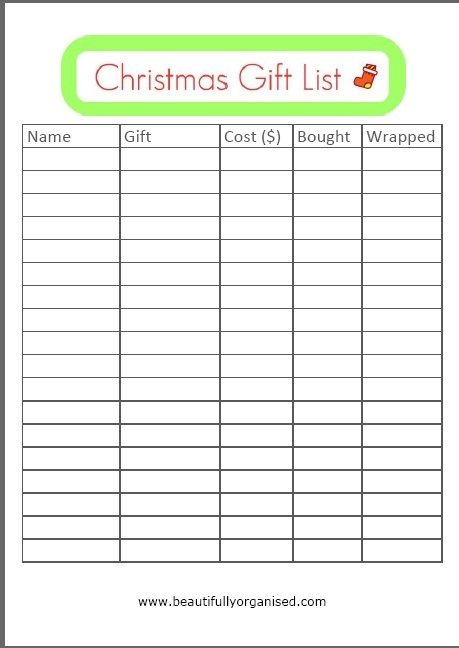 Jot down an idea of how much each gift cost - if you still have the receipt, great. If not, just put down a rough idea. Start by filling in the Name column. 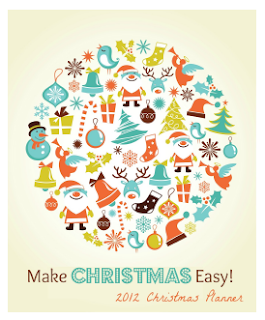 Then in the Gift column, jot down an idea for a present for each person. Next, write down how much you intend to spend in the Cost column. 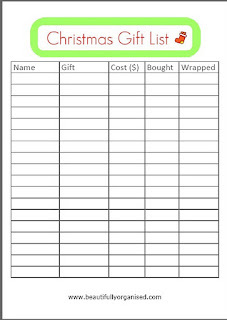 Keep your Gift List handy so you can tick off each gift when it's Bought and Wrapped - and your Christmas Gift organising will be a breeze..
My big tip for this page: Fill out your Gift List in pencil instead of pen - just in case you need to make any changes! I love the idea of saving money this year by making gifts. I'm thinking home made preserves and fresh baked granola in mason jars, ready to be given out as needed! It's a real pleasure to *meet* your blog!